Apologies for the momentary halt to postings. I'm currently swamped with classes and other responsibilities, but will return to updates ASAP. Until then, be sure to check out what others are saying on combat PTSD in the feeds in the right-hand column. Editorial: Veterans funding or permanent tax cuts? The U.S. House of Representatives and the U.S. Senate recently passed budgets that boost funding for veterans’ health care and other veterans’ needs at amounts higher than the Bush Administration’s proposal. The Bush budget boosts total VA funding by about 1.6 percent, or $1.7 billion. The House bill adds about $600 million to the Bush proposal, which would bolster overall spending to about 2.6 percent. The Senate adds $3 billion, making the overall spending increase about 5 percent. Many veterans groups have favored the congressional proposals saying the number of veterans entering the VA health system from wars in Iraq and Afghanistan warrants the extra funding. In fact, Congress and the president in the most recent fiscal year boosted VA funding by an “emergency” $3.7 billion appropriation midway through the budget year after seeing tremendous increases in health care costs for veterans returning from Iraq and Afghanistan. That figure is close to the increase being proposed by Bush. KTRE-Ch 9/East Texas has published a comprehensive veterans resources guide chock full of phone numbers and information that is a must to check out if you're an area military family. Sen. Chuck Grassley [R-IA] and the White House are tossing letters back-and-forth with one another, the senator aiming to get the president to "establish the goal that 10 percent of all new hires by federal agencies be veterans." Meanwhile, Senate colleagues are attempting to extend foreclosure protection for veterans to nine months following return from overseas deployment. The National Alliance on Mental Illness (NAMI)--Kern County, Calif., chapter offers returning vets, military families local support group services. Phone 661-868-5061 for more information. On the other end of the country, a related feel good story: 11 Tampa Bay-area Vietnam veterans, aka 'Group 11,' have had their PTSD group therapy sessions reinstated after the VA abruptly terminated the program. "We're pleased, and we're shocked," said one member after hearing the news. Back in September, I sat down with Diane Strand, a reporter for DeKalb's MidWeek News, to discuss combat PTSD and other issues covered in my book, Moving a Nation to Care. Those of you who read PTSD Combat regularly know I'm currently a student at Northern Illinois University and shared my experiences the day of the shooting and beyond. Just this past Wednesday, I posted here on my column that ran in the Northern Star, relfecting on the fact that veterans are a dazed school shooting student's natural ally; they understand the pain and trauma of being in danger and in the vicinity of extreme violence (on an entirely different level than those of us on campus that day, however). Another commonality is an increased risk for post-traumatic stress disorder. A&E's Intervention program recently featured a segment on Brad, a young man coping with his PTSD by self-medicating with alcohol and marijuana after two Iraq tours with the 101st Airborne. For those unfamiliar with the show, Intervention is a "series in which people confront their darkest demons and seek a route to redemption" by profiling "people whose dependence on drugs and alcohol or other compulsive behavior has brought them to a point of personal crisis and estranged them from their friends and loved ones." Brad's journey is a powerful and important episode. Yesterday, in morning testimony before the House Veterans Affairs Subcommittee on Health, we heard Colonel Charles W. Hoge, M.D., Director of the Division of Psychiatry and Neuroscience at Walter Reed Army Institute of Research, say studies show "longer deployments, multiple deployments, greater time away from base camps, and combat intensity all contribute to higher rates of PTSD, depression, and marital problems." Today’s Army is out of balance. The current demand for our forces in Iraq and Afghanistan exceeds the sustainable supply and limits our ability to provide ready forces for other contingencies. ...Current operational requirements for forces and insufficient time between deployments require a focus on counterinsurgency training and equipping to the detriment of preparedness for the full range of military missions. Given the current theater demand for Army forces, we are unable to provide a sustainable tempo of deployments for our Soldiers and Families. Soldiers, Families, support systems, and equipment are stretched and stressed by the demands of lengthy and repeated deployments, with insufficient recovery time. Equipment used repeatedly in harsh environments is wearing out more rapidly than programmed. Army support systems, designed for the pre-9/11 peacetime Army, are straining under the accumulation of stress from six years at war. Overall, our readiness is being consumed as fast as we build it. If unaddressed, this lack of balance poses a significant risk to the All-Volunteer Force and degrades the Army’s ability to make a timely response to other contingencies. Yesterday, the House Veterans Affairs Subcommittee on Health convened a long-anticipated hearing on Post Traumatic Stress Disorder (PTSD) Treatment and Research: Moving Ahead Toward Recovery. The hearing was the first to be telecast live from the House committee's website and can be viewed online in full today. 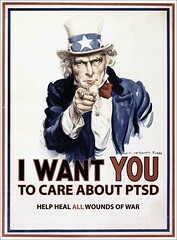 Post-traumatic stress disorder is among the most common diagnoses made by the Veterans Health Administration. Of the approximately 300,000 veterans from Operations Enduring and Iraqi Freedom who have accessed VA health care, nearly 20 percent –60,000 veterans- have received a preliminary diagnosis of PTSD. The VA also continues to treat veterans from Vietnam and other conflicts who have PTSD. With the release of the 2007 IOM report “Treatment of Posttraumatic Stress Disorder: An Assessment of the Evidence,” we learned that we still have much work to do in our understanding of how to best treat PTSD. I hope that my colleagues will continue to work with me in supporting VA’s PTSD research programs. I look forward to hearing testimony today from several organizations that are working to provide comprehensive and cutting edge treatment to those with PTSD. The committee recognizes that this is an important issue and one that will be with us for a long time to come. We are committed to ensuring that all veterans receive the best treatment possible. We at home often don’t realize the full value of our returning veterans. While some of us know we should be there for them as they return to us after deployment, many of us don’t realize that they are equipped to help us, too. Their knowledge and presence are more important to us as a civilian population than we realize. It’s been nearly seven weeks since NIU’s Veterans Club lost one of its own – 12-year Army veteran Julianna Gehant – on that dark February day that took the lives of five others on our campus. At Julianna’s funeral service, Rev. James E. Kruse spoke of the decorated soldier’s life and the circumstances of her death. He speculated about Julianna: Was she the woman students heard calling for others to run from a shooter as he reloaded and prepared to strike again? “I don’t know for certain, but she’s a hero in my mind,” Kruse said at the Holy Cross Church service. The dedication ceremony for Julianna Gehant begins at 11 a.m. Friday at the NIU Veterans Memorial, on the corner of College Avenue and Castle Drive (across from Lowden Hall and next to the East Lagoon). The public is invited to attend, as are all students and faculty. "Coming Home: What to expect, how to deal when you return from combat" is a new project by Military OneSource. Created by comic book masters Sid Jacobson and Ernie Colon, who formerly worked at Harvey and Marvel comics, it is aimed at service members who have worn combat gear every day for a year. It's aimed at people who see potential IEDs at every intersection. It is aimed at guys who come back to the States to feel fury at traffic, and women who find that half the world thinks they're bad mothers because they had to serve overseas, and family members who can't understand why their returning soldier or Marine is drinking so darned much. This comic is aimed to help folks who need to learn about post-traumatic stress disorder. Because I wasn't one of those people, and I wasn't sure how I felt about treating a subject as serious as combat and operational stress response in a comic book, I threw "Coming Home" into a stack of reading material to look at later. Not a minute later my 14-year-old picked it up. Then the kindergartner. Then our houseguest, a 48-year-old former Navy helicopter pilot. "What kind of aircraft is that?" he asked, holding the cover up to the light from the sliding glass doors. Then he read the whole thing.